Laura Linney, Philip Bosco, and Philip Seymour Hoffman star in a film written and directed by Tamara Jenkins. 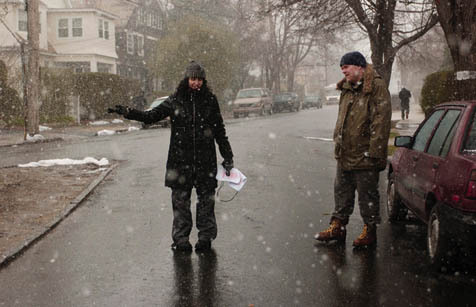 Tamara Jenkins (left) directs Philip Seymour Hoffman in The Savages. Caring for an elderly parent with dementia reveals a lot about a family, and not all of it is nice. Wendy (Laura Linney) and Jon (Philip Seymour Hoffman) Savage have not received much love or support from their parents, and as the story begins, they face their forties with diminishing expectations. He teaches drama at a college in Buffalo, while she lives in New York’s East Village, temping and writing grant proposals to support the composition of autobiographical plays. Neither sibling is married. Jon’s Polish girlfriend must leave the country because her visa has expired, and although he weeps at his inability to commit, he can’t find it in himself to marry her. Wendy continues an affair with an older married man that often makes her feel wretched. The thing she likes most about the guy is his dog, and even though she realizes it’s pathetic, she clings to the relationship out of habit. Everything changes when a surprise phone call comes about what’s happening in Arizona, where their dad, Lenny Savage (Philip Bosco), has been living with his severely incapacitated girlfriend. Lenny acts out toward his companion’s caregiver, and, by the time the two siblings arrive, the old man’s girlfriend-and his temporary home-are no more. It’s up to Jon and Wendy to find somewhere for Lenny to stay, and what follows is an introduction to the world of managed care, a place where every decision is a compromise and the battle is to keep from crying through every painful, degrading minute. Hoffman is particularly good at achieving the self-righteous critical clarity about bureaucracy that his character seems to need to evacuate his emotional system. Wendy is just as confused by what she feels, and her answers are equally useless. First she shares a cigarette break, then an ill-advised and intensely awkward kiss with the most empathetic of her father’s caregivers. The film’s understated script and deft cinematography mesh perfectly with its performances. The charity of these hard moments becomes apparent as it is doled out, and the ephemeral beauty of life shines in a thousand homely details, from Jon’s cramped, threadbare home to the abandoned shoes that swing from Buffalo’s icy telephone lines. Cinematographer W. Mott Hupfel III has a lot to be proud of, as does everyone involved in this humane gem of a picture.